Delicately scented, Bigelow Earl Grey tea is a classic flavor that your tea assortment cannot do without! Earl Grey tea blends robust black tea with real oil of bergamot from Calabria, Italy. The caffeine content in the black tea provides the pick-me-up your guests need throughout the day. When brewed, this aromatic tea has a dark copper color and a full-bodied flavor with a subtle citrus finish. This all-natural tea makes an excellent addition to any business. I've been drinking this brand of earl grey tea for a few years now and this is my favorite tea flavor. It is not too bold in flavor and it does not keep me up at night. This tea is also great for making earl grey tea macarons. I cut open 4 tea bags and add the tea into my dry mix of almond flour to make macaron shells. They come out fragrant from the oven. I also appreciate that it is all natural which is a big plus for me. There's a reason why our agency only gets Bigelow - this like the green tea is the perfect earl grey. Most of us put a splash of milk no sugar needed. Our biggest seller! Everyone loves the Earl Gray Tea by Bigelow. It has a nice robust flavor, a lively aroma. and it colors up nice and dark. We love it. Earl Grey is my favorite in excellent rich flavor and plenty of aromas. I sell this individual packs in my cafeteria with a really good profit margin. I really like the flavor of Bigelow teas and the Earl Grey is no exception. It smells and tastes great...And the price is right! I recommend this tea! The Bigelow earl grey tea is great and makes a nice beverage option at breakfast. The tea pairs great with cream and sugar and taste amazing. One of my favorite tea product. I’m ordering this tea for my shop regularly. I’m serving this tea approximately for 2 years without any complaints or returns. I love the simple flavor of earl grey tea and this one has it all. It makes excellent London Fogs and really packs a flavorful punch. Earl Grey is my all time favorite hot tea and our customers love it, too! It is great on its own or with a touch of honey. Bigelow Earl Grey Black Tea gives a very intense fragrance filled smell upon opening the bag. It has a great dark tea color and gives an overall soothing taste one yearns to experience from a high quality tea. This 28 count box of Bigelow earl gray tea is a great value. Each teabag makes one cup of tea. Simply place into hot water and steep 2-4 minutes. The Bigelow earl grey tea is wonderful and is perfect to pair with lemon and sugar cubes. A nice addition to our tea bar and the tea bags are a great quality. The Bigelow Earl Grey tea makes for a nice overall cup of tea that many people including those who don't normally drink tea will appreciate. It has a nice rich aroma and flavor to it. I had never ordered this twenty-eight pack of Bigelow Earl Grey tea before and it is delicious. While I stuck to the hot version of this tea, my wife went with an iced version and was just as pleased. The aroma will freshen any room with a combination of lavender and orange and I do taste a subtle orange flavor. I would order again. This earl grey tea tastes wonderful. Bigelow is one of the most popular tea brands out there. They have sealed individually wrapped tea bags to keep the tea fresh. I LOVE Earl Grey tea, and I love Bigelow brand. It has pleasant aroma with full-bodied flavor. I also love this bigger box with 28 individually foil-wrapped tea bags! The Bigelow Earl Grey Tea is great for insominacs but, it has a great taste and can be used at any part of the day. I just had some earl grey tea yesterday and I don't know why I don't drink it more often. It's more of a complex flavor but I just love it. A lovely and smooth tasting earl grey tea that hits the spot anytime of the day. The tea smells great steeping and is so good on a scratchy throat. Great tasting and aromatic Earl Grey Tea. 28 in a box makes for a great value. Foil packs are more water resistant than paper if you accidentally get it wet. Easy to open as well. A very aromatic tea that is very soothing and relaxing for a sore throat. We serve this hot with lemon and sugar cubes to our guests at our afternoon luncheon. The scent of earl grey tea is enough for me to brew it. It is so fragrant and fruity and the flavor is equally amazing. Earl grey is such a versatile flavor. Much more fruity than other grey tea brands. Goes well with any meal time or even mid afternoon snack. Great shelf life and price. wonderful tasting Bigelow Earl Grey Tea..its one of our best sellers in our diner. we just had to reorder it. lots of great products on here. Earl Grey tea is my absolute favorite! I'll usually drink it at night when I'm ready to relax. The tea bags are super easy to just throw into some boiled water. It only takes about 5 minutes to make my tea! I would buy this tea just to smell it as an air freshener if I could. It's that good. Nice and fruity and very tasty. This is my favorite flavor of tea. I am typically a coffee person but when I'm in the mood for tea I always reach for earl grey. I love it. Earl grey tea is a staple in our house. It has a great flavor and in my opinion and even better smell. My husband and I agree that it almost smells like fruit loops cereal. Full and flavorful earl grey tea. Easy open and grab box allows for a quick way to get the bag and into the water and served. I love this black tea. It's earl grey and has a great taste! This tea is 30-60 mg of caffeine. It's also gluten free. This tea only takes about two minutes to steep. Great subtle english breakfast type of flavor with this tea. Everyone That I have served this tea to has absolutely loved it and asked me for the brand without fail. Earl grey from Bigelow is just a perfect black tea with really specific flavor. You will enjoy really nice aroma and outstanding flavor. Price is right too! Our coffee shop uses lots of this Bigelow earl gray tea in our London fog drinks. Customers love the tea aspect of this drink which comes from the excellent quality of this Bigelow tea. We are sold on this particular brand. This tea has a very nice flavor. Delicious with sugar and even a splash of milk. It has a strong flavor but is still incredibly smooth and pleasant to drink. I can't say I've ever really enjoyed earl grey tea, but decided to give this a go. Still toesn't taste great to me, but I can tell it's quality. Earl Grey is one of those flavors that you either truly love or it is just not your cup of tea. Bigelow Earl Grey is rich, dark, and has the bergamot floral essence that makes earl grey the distinct flavor it is. BIgelow has great packaging and they look great on display. 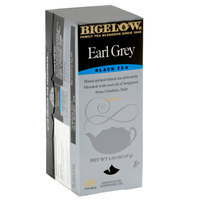 The Earl Grey Tea from Bigelow has been a great seller for us. People love the flavor and the aroma is very nice. I highly recommend buying. This is my go to earl grey. Flavor is always perfect and I have never had a stale bag of tea. The only thing better than this Earl Grey is a cup of double bergamot Earl Grey. Bigelow Earl Grey Tea is one of the popular brand of tea choices. It has a bold flavor that I personally enjoy. The pricing on this product is well suited for producing good quality produce at a great price. Great tasting product! Great Value. My customers love the great full bodied flavor, and the option to add more hot water and use it for a second tea. Thanks Websturant! I love Begelow Earl Grey Tea. Webstaurant Store also has one of the best price on it as well. The box is also has an easy open bottom, for dispensing. I would recommend. Bigelow's earl grey tea is a great "everyday" tea. Each teabag is individually wrapped for freshness and getting 28 in this box as opposed to the usual 20 makes this a great value. This tea did not disappoint! I normally stick with Twinings brand, but I thought I would give this a try since it was such a good value. I am glad I did! Good flavor and good packaging. I recommend! I love this Bigelow earl grey tea. It will always be in my cabinets at home. And I will be back to order more when the need arises. I've been using Bigelow's tea products for 10+ years. And there earl grey for about 9 of those years. I must recommend there products. i love this tea and I love the box design. I like that they are individually packaged. This is my favorite tea flavor. I will order this over and over again. Who doesn't love a good early grey? Also, who rejects bigelow when it comes to tea? This is a win! You can't go wrong for the price webstaurant offers. A decent Earl grey with nice bergamot flavor and a robust black tea backing it. Right in the middle of the Earl Greys available on this site. Will go with others, but overall not bad. The classic tea which every coffee bar needs. strong sturdy flavor with an herbaceous finish, I defiantly will be buying again. The Individual packaging makes for a professional look on our coffee bar. The aroma is strange, probably because I'm not familiar with bergamot. The taste is surprisingly smooth and has not bitterness to it considering it's a black tea. The bergamot adds a strange aftertaste but is quite tasty. This tea tastes great and the price is outstanding! The packages were nice and thick and kept the tea very fresh. Great deal all around. This tea is very aromatic and flavorful. I am impressed with its spicy richness. This price is a great value for Bigelow teas. It is more expensive in grocery stores, and it's great that Webstaurant carries this brand. The aroma and freshness of the tea is a crowd pleaser for every event we cater using this product. The packaging is visually pleasing as well and provides us with confidence every time we use this product. Very tasty tea, it's always a hit at any of our events, the fact that these are all individually wrapped is perfect for keeping this tea fresh. Very smooth, mellow tea. Very good traditionally flavored Earl Grey tea choice. One bag is strong enough for a 16 ounce cup of hot water. Better priced than a store front would sell it for. Customers enjoy this tea. Bigelow Earl Gray is the best and most consistent tasting on the market. I buy this tea for my self and my customers over any other brand. We purchased these to an event and meetings. Our guests enjoyed having the Earl Grey Tea as an option for breakfast, lunch or with a snack. Good price for the tea! I can't say anything more but awesome taste for a good price and awesome quality. Love it! Great product for the price. How often do you find a rich in flavor and strong bodied tea for a couple of cents a teabag? I'm partial to Earl Gray and have tried a bunch of other more fancy brands too. The Bigelow Earl Gray doesn't disapoint. The Bigelow tea products are really great. It's a great product for a great price. The Earl Grey is just another example of one of their great teas. This tea has much more appeal with our guests at the bed and breakfast than I first thought. We have had to re-stock it to meet demand. Bigelow Earl Grey Tea an essential part of my tea service. Bigelow is known for great quality and the Webstaurantstore.com sells it at an amazing low price. I love this tea and this is a great price especially when you buy the entire case. You will not be dissappointed with this tea.